As a California native I have always been drawn to the coast. When I first started driving in Los Angeles, I was constantly getting lost and always ending up at the beach. 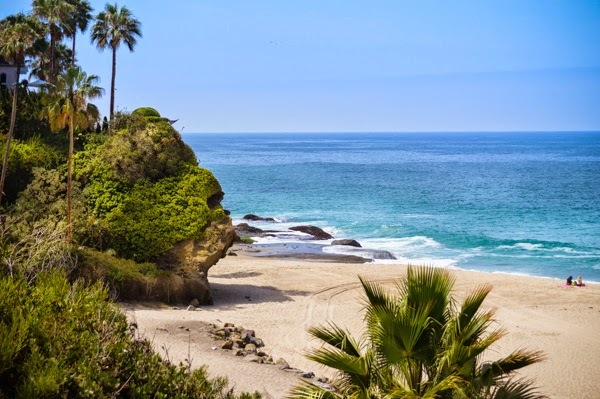 Between Los Angeles and San Diego we have some epic coastal scenery; it’s easy to stay on the freeway and miss some of the best places! Next time you’re passing through or even doing a west coast road trip, check out these coastal gems. I promise you won’t be disappointed. The ocean is super aquamarine here because it is part of a protected marine reserve and the water is clean. It’s really not like this in other parts of California. 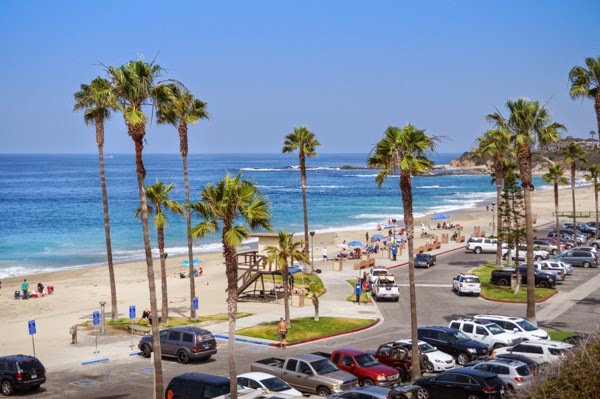 The sand is soft, the strong waves are great for body boarding, and the easily accessible tide pools are best visited in the morning. 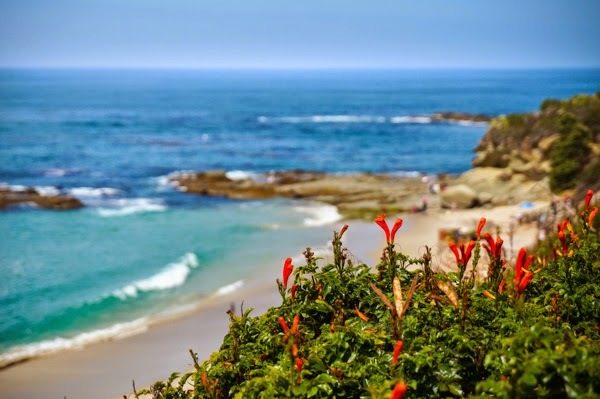 It is not uncommon to see bottle-nosed dolphins in these waters or even California sea lions which have been known to pop up near the local surfers. Bonus: because it’s a county beach, it has bonfire pits and dogs are allowed (leashed). 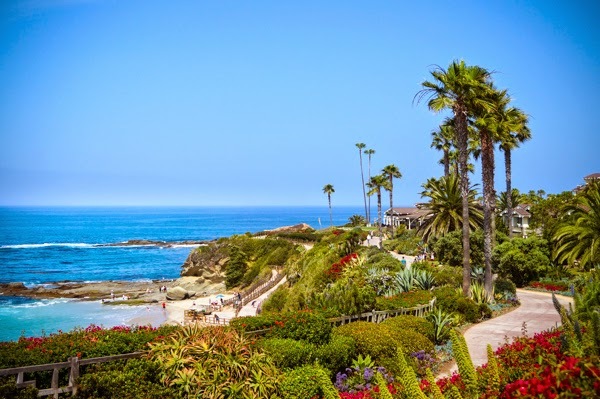 Located ocean-front at the Montage Hotel (just minutes from Aliso Beach) is one of the best ocean views you’ll see in southern California and it won’t cost you a penny. 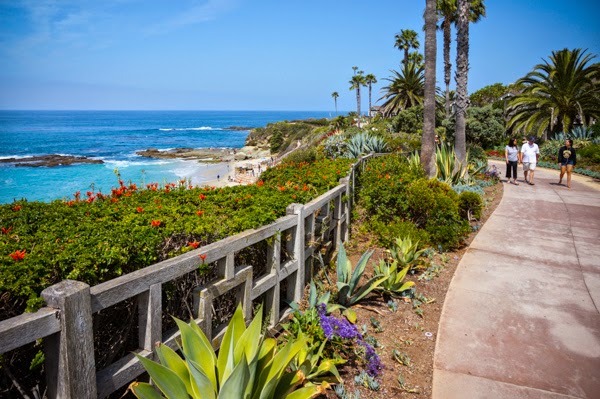 The cliff-top walking path is lined with colorful flowers and there’s plenty of excellent photo opportunities and beach access. And yes, the ocean here is still that stunning aquamarine color. To get here, follow PCH and turn at Wesley Drive (on the west side) and park. 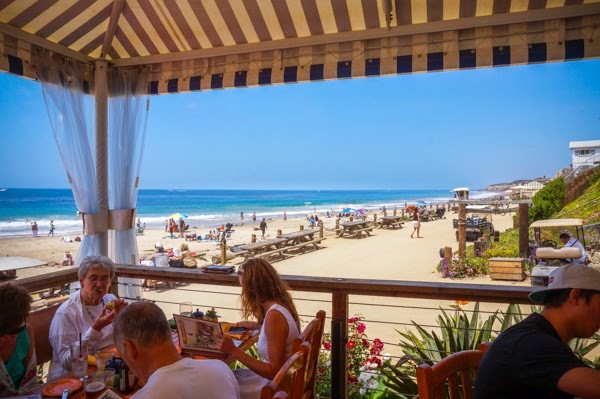 Located directly on the sand is this fantastic cafe with excellent food and drinks. If you’re interested in exploring beyond your appetite, this California State Park has a lot to offer. 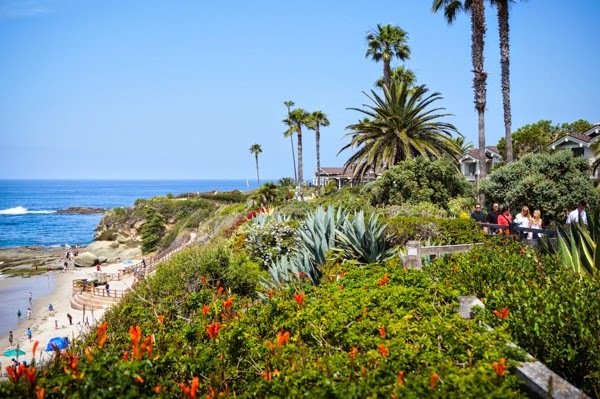 You’ll find hiking trails, tide pools, a visitor center, shopping promenade, beach cottages and more. 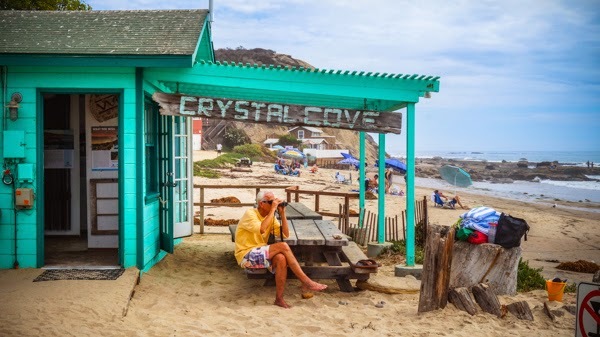 I featured it on my website here: Why Visit Crystal Cove? Located on PCH, Madison Square & Garden Cafe is an excellent casual breakfast and lunch spot and is also dog-friendly. Think lemon ginger ricotta pancakes with berry butter or choices of fresh omelets, salads, burgers, sandwiches and catch of the day. Head over to the rooftop lounge of La Casa del Camino and watch the sun set over the Pacific. Happy Hour is Monday-Friday 3-5pm. Capt. Dave’s Dolphin and Whale Safari in Dana Point is an adventure I can’t recommend enough; if you have 2.5 hours to spare, book your tickets and go. With two excursions scheduled each day, these nature loving experts take you on their small catamaran and you’ll get extremely close to the wildlife. I just did this trip and saw five blue whales – the largest animal on earth! Perfect for a leisurely walk with cute shops, art galleries and wine bars and head down to the ocean front path. Their Saturday morning farmers market is small but a nice treat; grab some organic fruits and nuts, yogurts or fresh hot coffee. Cliff-top view of some tide pools at Treasure Island Beach. 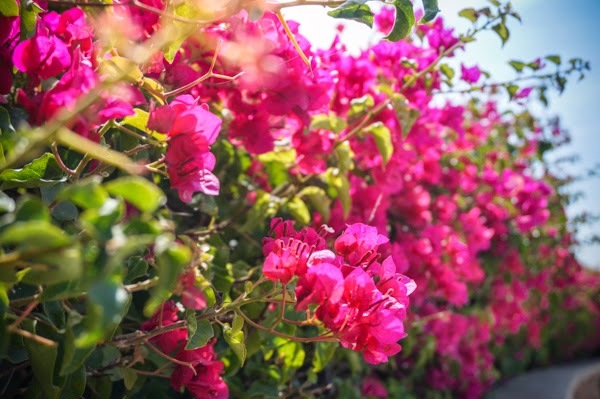 Vibrant bougainvillea blooms along the path at Treasure Island Park. Beach access from Treasure Island Park. View from the path at Treasure Island Park in front of the Montage Hotel. Dining deck at the Beachcomber Cafe. Crystal Cove State Park, tide pools on the right. A rock cove at Aliso Beach. Look at that turquoise water! The beautiful waters of Aliso Beach. 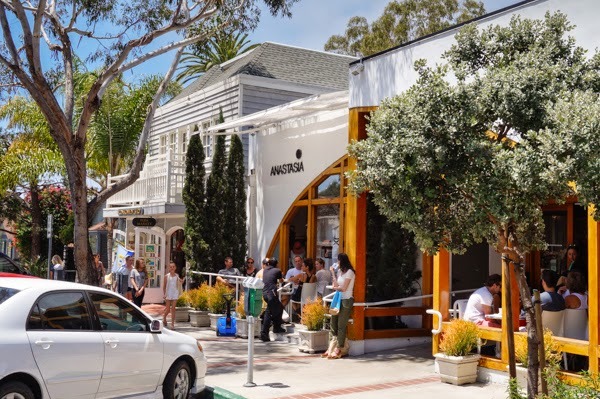 Downtown Laguna Beach shops and cafes. 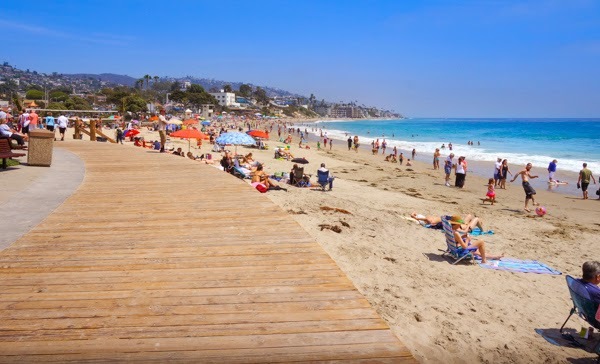 The path at Downtown Laguna Beach.